There are a number of Advent devotionals and Jesse Tree devotionals available for families, but I wanted a women’s Advent devotional that could be used year after year, was short, sweet, and to the blessed point. I wanted a women’s Advent devotional that would cause us to stop, and ponder deep within our hearts the scriptures of the Advent season. I also know the budget constrictions we face every year around the holidays, well, all year if we’re being honest. Every year around Advent I would see some new, “Make this your best and holiest Advent ever,” book announced only to realize, I couldn’t justify spending that money on a book for myself when there were so many other people and things on my list. All I really needed was a simple little book that was spiritually rich and soul-satisfyingly deep, and most importantly, free. 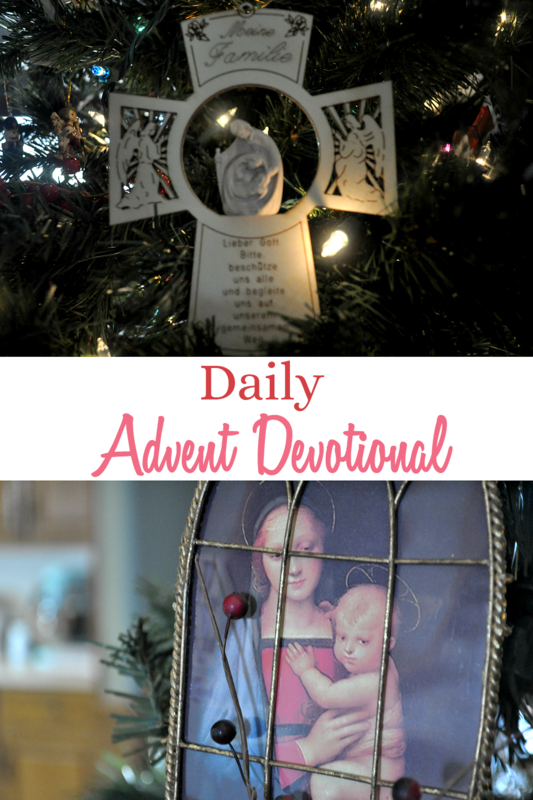 A simple, spiritually rich, soul-satisfyingly deep, free, women’s Advent devotional. I wrote this women’s Advent devotional to be available to every soul who wanted or needed it. I wanted this to be a timeless book that will never go out of style or be obsolete next year when Advent started on a different day. I wanted this book to be a conversation we would share together during one of the most hectic times of the entire year. This women’s Advent devotional follows along the common scriptures used in the Jesse Tree readings. See, I know our life is made up of repeated moments or constant demands as they sometimes feel. This repetition presses deep into our hearts and minds, and the memories solidified. Many families read Jesse Tree devotionals and stories each year. This yearly reading forms impressionable memories and Advent habits; I wanted this Daily Advent Devotional for Women to do the same. We all know the benefit of repeated exposure to the same Scriptures. It’s one of the ways we are called to hide the Word of God in our heart to keep us from sin, this habitual practice, this recurring meeting with the Word. What better way to hear the same truth, the same Word, twice a day—once with our family and once just a quiet whispering between a God and His girl. Thy words have I hidden in my heart, that I may not sin against thee. Read these daily meditations in the morning, before you read the family Jesse Tree meditations or read it at night before bed, letting the Word soak deep into your mind as you drift off to sleep. Not only are we called to hide the Word, we are also called to meditate on the Word, day and night. Blessed is the man who hath not walked in the counsel of the ungodly, nor stood in the way of sinners, nor sat in the chair of pestilence: But his will is in the law of the Lord, and on his law, he shall meditate day and night. I pray that these meditations in the women’s Advent devotional, often short, will slow you down, calm you down and bring you into the presence of God the Father, God the Son, and God the Holy Spirit. If our first father Adam had not transgressed, God the Father would not be sending His only Son. Without the sin of man, we would not be preparing for the birth of the God-Man. Those thoughts can make us slow down quickly…talk of sin and death in the midst of sparkly Christmas Cheer…mention gluttony amid glittery decorations, and you can lose a room of people fast. But that’s the reality of the birth of Christ and Advent is a time to prepare, a miniature Lent if you will.